Roadster pick up in STR? 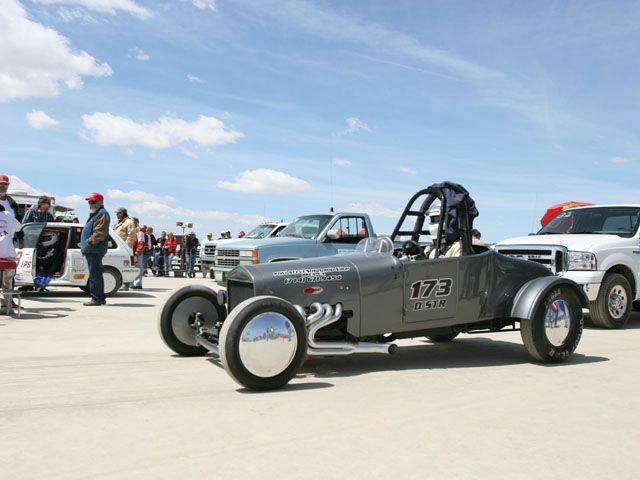 Landracing Forum Home > Bonneville Salt Flats Discussion > SCTA Rule Questions (Moderator: Seldom Seen Slim) > Roadster pick up in STR? Re: Roadster pick up in STR? No problem Tman. I was just bugging you. Personally, while NOT an aerodynamics expert, I am pretty much of the belief that frontal area is frontal area whether the car is wide and low or narrow and tall..... but a body panel that is set at an angle in the same frontal area will, in ALL likelihood, create less drag than a vertical "flat to the wind" panel....and the Cd is a consideration that needs to be factored in. As a chassis builder, my big question would be - can we get you into or out of a seating position which you can enter/exit with ease as well as drive the car without your knees locking up etc (knee problems are MY problem - so - just saying)? Yeah, the wheel question set aside, fitting in the car will be a challenge. I sat in Rich'a roadster and was setting up my head/neck restraint yesterday. His car is tight and the seat is behind the stock seating location since his car is a GR. So that got me thinking. To be honest I have concerns about the roadster pick up body style. The bed sticks off the back of the car, I would venture to guess that over 50% of it hangs behind the rear axle. If the wind is trying to push it down...or up , I imagine that it will act a lever. I don't have the body here, it is in Ojai so the next time I can go take a good look at it I will take some measurements and pictures. I see it being tight but not impossible. I agree and it certanly looks neat but I think the drag penalty of the rear tires will be a big handicap. I would love to see your car, are you taking it to any events this year? The way I read the rules I thought having a suicide front end would not be legal. for some reason I assumed the axles need to be in the stock position, only allowing moving the front axle forward three inches by stretching the hood? Interesting note on this photo, it was from a hot rod publication website, one of the big ones and the caption was "El Mirage Salt Racing? " I guess the person who wrote the article thought that was salt blowing around everywhere. BTW....This car looks an awful lot like the car that used to belong to Nate Sable in the late 70s..... It is something in the shape of the top of the roll cage. I remember this because my younger brother towed the car out to the SF Bay area for the person who bought it from Nate in about 1980.... I gave the whole trailer and hitch area a good going over as well as the car, of course, before my brother left the salt. The wheels outside the fenders are a no go....surprised anyone? I think that is not the Nate Sable car, I believe Bob and Judy Sights had that car and the chassis has supsequently been junked. Update- In my reply I pointed out the rule, Russ agreed with me on my interpretation, the wheels can be run as I constructed my model. That doesn't mean it is a good idea but maybe it would be interesting to try something outside of the norm. My basic idea for the build allows me to raise or lower the rear end in case this idea is a complete failure. I am excited in general about this build and have come up with some ideas I think people will find interesting. I think a build thread will be coming here in the future. As I remember. The rule used to be stock width or you could go a little wider to clear the body on channeled cars. Then Tone came out with his Bantam and other roadster guys cried that his rear tires were inside the body and not out in the air like theirs. Tone said his rear axle was stock width for a Bantam and he was within the rules. So the rule was changed to 50 inches to make the model A guys happy. And also applied to Street Roadsters. But the rule is poorly written and appears to allow what you propose. I believe that is not at all what they had in mind when the current rule was written. And if anyone actually came out with such a car the rule would be properly written. On another note . . . Does anyone remember the guy that had a long, flowing blue line that represented the car he wanted to build? And he was searching for the proper name for the team? Anyone know how that project's coming? Is there a point Stan? I kind of remember seeing that thread.